ONE MANS JUNK IS ANOTHER MANS TREASURE. THERE IS A WIDE ASS0RTMENT OF ITEMS IN THIS LOT. SOME ARE NEW AND OTHERS ARE USED. THEY ARE JUST ITEMS THAT I NO LONGER NEED OR WILL NEVER USE AGAIN. 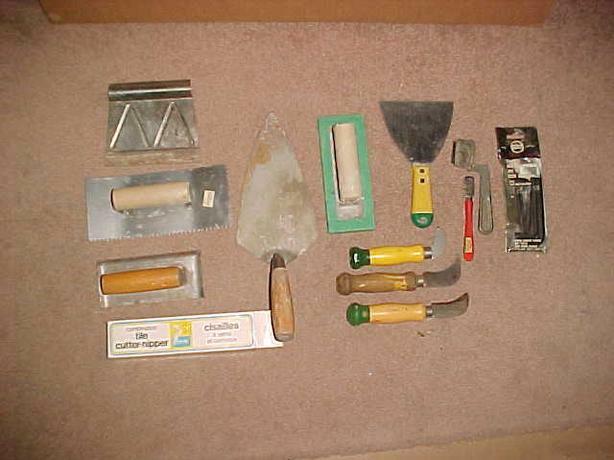 ITEMS RANGE FROM A VINTAGE RED DEVIL JAK-NIFE, TO AN ISHII TILE CUTTER=NIPPER TO A TROWEL ALL ARE IN NICE CONDITION AND STILL SERVICEABLE.